A cruise liner full of passengers from China and abroad set sail on Jan 18 from Copenhagen DFDS cruise terminal on a voyage to offer a colorful insight into Chinese culture through the theme: "Happy Chinese New Year". Aboard the cruise liner, various activities centered on Chinese Spring Festival, culture and tourism were held throughout the trip. The event was co-hosted by the Beijing Culture and Tourism Bureau, Copenhagen China Cultural Center and the Danish-United Steamship Company. Chen Dong, deputy head of the bureau, said that hopefully, the event can promote further communication and cooperation in the cultural tourism sector between the two countries, enhancing the understanding between people from both countries. 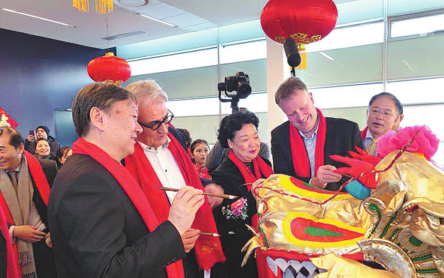 Henrik Holck, vice-president of the steamship company, said he felt proud that Chinese tourists chose to spend Spring Festival, or Chinese Lunar New Year, aboard the vessel. "As foreigners, we have learnt much about the Chinese culture through the events on board the ship," he said. Denmark and China has a long history of friendship, with Copenhagen and Beijing becoming twin cities in 2012. Communication between the two cities, across a range of sectors - government, institutional, cultural and tourism - has been increasing in recent years. According to the Culture and Tourism Ministry, more than 1,500 cultural programs will take place in 396 cities across 133 countries and regions during Spring Festival. Luo Shugang, minister of culture and tourism, noted that "Happy Chinese New Year" has become the leading cultural exchange program with the widest coverage, the largest number of participants.